Meet “the new full-size class” in Audi’s product portfolio. 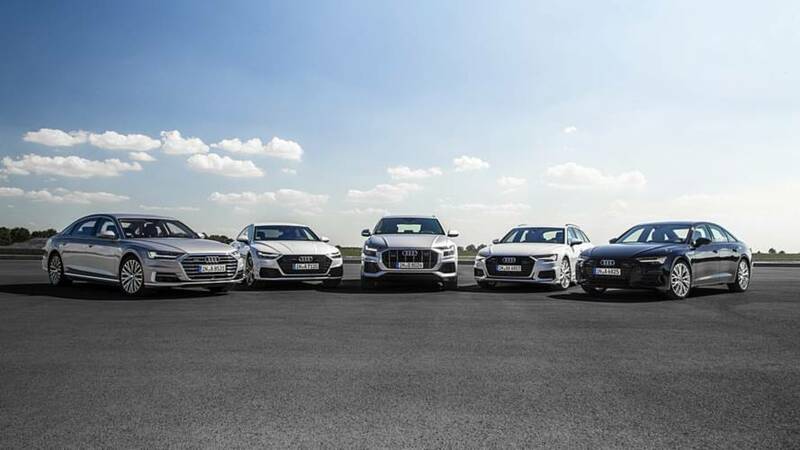 This is how the German premium manufacturer describes the A8, A7 Sportback, A6, and Q8, its most luxurious and technologically advanced vehicles, which are currently also the newest additions to the brand’s lineup. All four of them, together with the Q7, are already available to order and can be experienced at Audi dealerships across Europe. The A8, A7, and A6 model lines have been completely overhauled over the last 12 months and benefit from a new design language, advanced technologies, and new powertrains. Thanks to consistent technology transfer, the three sedans share a number of tech modules, including the MMI touch response operating system, the broad-based electrification with standard mild hybrid system, new suspension components such as the dynamic all-wheel steering, and a host of driver assist systems. The premium trio was recently joined by the new range-topper in Audi’s SUV lineup, the Q8. It should appeal to “design-oriented customers” with its attractive four-door body style and a luxuriously-equipped cabin with numerous comfort and connectivity features from the A8. The coupe-SUV is already on sale in Europe with a starting price of €76,300 or €15,100 more than a base Q7. The only available engine, for the time being, is a 3.0-liter six-cylinder diesel with 282 hp (210 kW) and 443 lb-ft (600 Nm) of torque. The U.S. version will be launched in the fourth quarter of the year. It will be interesting to see whether Audi will launch an even more expensive and opulent SUV model. Reports have already emerged about a potential Q9 range-topper using the same underpinnings, and the automaker already has “so many ideas, so many ideas...” in mind. If it ever gets the green light for production, it will be aimed against the plushest Range Rover versions and even the Bentley Bentayga and the likes. Check out the press release section below for more details about the technologies in the A8, A7, A6, and Q8. The new Audi Q8 (combined fuel consumption in l/100 km: 6.8 – 6.6*; combined CO2 emissions in g/km: 179 – 172*) delivers its very own interpretation of a large four-door SUV coupé with its striking design and excellent adaptability. Together with the Audi A8, the Audi A7 Sportback and the Audi A6, it constitutes the new full-size class in the brand’s product portfolio. With their extensive package of innovative technologies, the full-size models once again underscore “Vorsprung durch Technik” and offer customers a great deal of utility value. With the market introduction, customers can now experience the new Audi Q8 at Audi dealerships. The four-door coupé is the top-of-the-line model among the SUVs and Audi’s latest member in the full-size class. 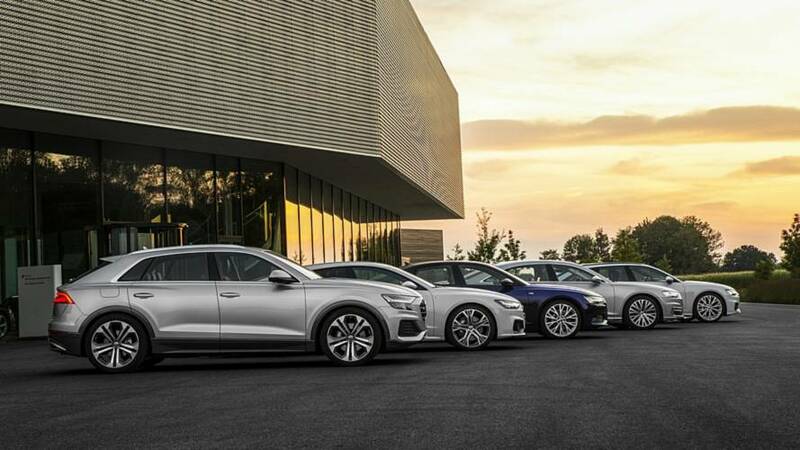 The premium brand has renewed its A8, A7 and A6 model lines within the space of a year, and crowned its SUV portfolio with a new top-of-the-range model, the Audi Q8. Regardless of whether it is a SUV coupé, Gran Turismo or business sedan, the new full-size models combine a shared DNA, both in terms of design and technology. Compared with each other, however, they boast totally different talents and configurations. The model and technology campaign got underway with the Audi A8 in July 2017. The Audi flagship conveyed for the first time the new design language and underscores the brand claim “Vorsprung durch Technik” thanks to its many technical innovations. These include the futuristic MMI touch response operating system, the broad-based electrification with standard mild hybrid system, new suspension components such as the dynamic all-wheel steering, and a host of driver assist systems. Thanks to consistent technology transfer, the other full-size models adopt numerous technology modules from the luxury sedan – enabling them to offer a unique technology and driving experience in their segment. The new design language is a visible sign of Audi’s new full-size models. All models share the quattro blisters in common – distinctively shaped contours above the wheel arches. They are a throwback to the Audi Ur-quattro and visualize the technology of the quattro drive. The heavily contoured center of the car contributes to this feel on all models. The striking Singleframe grille is flatter and wider on the A models and on the Q8 configured as an octagon to provide greater visual differentiation. The new Audi design language comes with a clear, unique hallmark – however with five individual characters. The A8 is the first Audi model from the pen of design chief Marc Lichte and marks the start of the new design language. While the A8 embodies elegance, sophistication and progressive status, the A7 with its large surfaces and muscular taut lines encapsulates the essence of the new design language, which the premium brand first brought to the public’s attention in 2014 with its Audi prologue show car. The A6 Sedan fascinates with its technical elegance, which expresses the out-and-out technical expertise of the four rings. It is compelling with optimum proportions and short overhangs. The A6 Avant combines form and function with its long, flat roof line and the highly dynamic, low-profile D-pillar. The Audi Q8 in turn with its octagonal radiator grille transfers the design language in a novel way to the SUV segment. The lighting design of the new full-size class constitutes a fascinating synthesis of design and technology. For the first time, the design embraces light in motion. Individual light sequencing on the front headlights and the rear lights underscores the model’s particular character when opening and closing the vehicle. 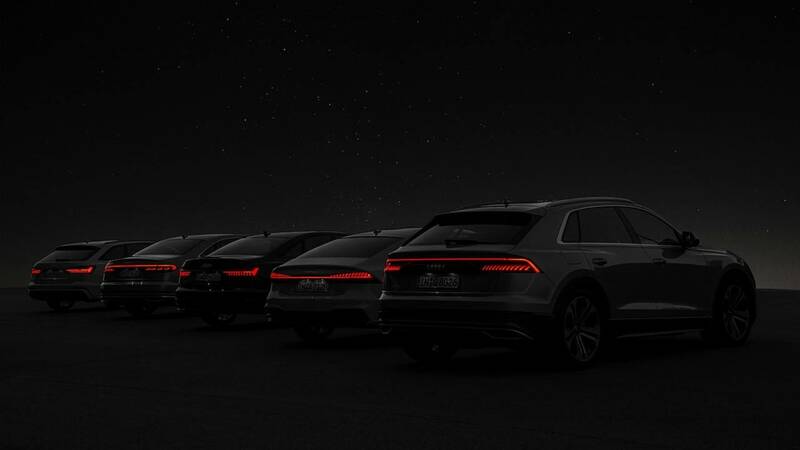 Audi A8, A7 and Q8 feature a full-length light strip at the rear. With the innovative lighting design, the brand underscores its leading role and makes technology – literally – visible. Clarity is the new premium. In the interior, driver and passengers can look forward to a cut-down interior design, which is characterized by large trim strips with a black-panel design. The clear, simple horizontal interior design creates a generous sense of space. While the A8 and Q8 go for a symmetrical arrangement of the instrument panel, the instrument panel on the A7 and A6 is angled toward the driver and the user interface – surrounded by aluminum clips – split up into individual “operating islands.” Individually configurable interior lighting such as the contour/ambient lighting package with a choice of 30 colors underscores the futuristic lounge atmosphere. The new Audi full-size class is based on consistent digitalization with the MMI touch response operating system and combines form and function. Instead of a large number of physical switches and buttons, two central, high-resolution operating screens on the center console control almost all the vehicle functions. Operation is intuitive, like on a smartphone. The tactile/acoustic feedback of the screens provides reliable access to functions even while on the move. Just like on a smartphone, the operating icons can be moved individually on the screens, and shortcuts and favorite buttons set up based on personal preferences. This digital user experience is rounded off with the high resolution Audi virtual cockpit. The online voice control system understands natural voice commands and can be activated conveniently via a steering wheel button. Audi’s full-size class is also innovative in terms of engines. To enhance comfort and efficiency, all models are fitted standard with mild hybrid technology (MHEV, mild hybrid electric vehicles). The Audi engineers have linked the MHEV drive to the vehicle’s sensors, thus ensuring anticipatory, predictive control along with enhanced efficiency. The six and eight-cylinder engines use a 48V MHEV system; the four-cylinder units come with a 12V system. At the heart of the 48V system is a belt alternator starter, which instantly and smoothly restarts the combustion engine. At the same time, it extends the start-stop system to up to 22 km/h (13.7 mph). Between 55 and 160 km/h (34.2 – 99.4 mph) the full-size models can coast fuel-efficiently with the combustion engine shut off. The drive management decides on the suitable strategy. The lithium-ion battery housed in the rear stores the recovered energy and passes this onto auxiliary consumers such as the air conditioning or the oil pump in the transmission. In real-world driving, fuel savings of up to 0.7 liters (0.2 US gal) are possible. The 12V MHEV system in the four-cylinder variants in the A7 and A6 model lines provides up to 0.3 liters (0.1 US gal) lower fuel consumption; the compact lithium-ion battery is housed in the forward structure of the car. The extensive range of suspension configurations ensures far greater driving pleasure and more ride comfort. The dynamic all-wheel steering is available for all full-size models, which – tuned to each specific model – ensures an even better synthesis of comfort and agility. The Audi engineers combine two different components. On the one hand, progressive steering with variable steering ratio, which combines a high level of steering comfort with a direct steering impulse. On the other, the rear-axle steering turns the wheels by up to 5 degrees in the opposite direction at speeds up to 60 km/h (37.3 mph), thus reducing the turning circle by up to 1.1 meters (3.6 ft). Above 60 km/h (37.3 mph) it steers in the same direction as the front wheels, thus improving straight-line and track stability. In this way, Audi resolves the conflicting objectives of direct steering response, high steering comfort and high agility. The adaptive air suspension, available as an option in the A6, A7 and Q8, and standard in the A8, enhances ride comfort. For drivers with more dynamic aspirations, Audi also offers a sport suspension, configured as an air spring suspension on the Q8. Controlled dampers as an all-round suspension are available as an option for the A6 and A7; they come fitted standard on the Q8. A8 Sedan and the long-wheelbase version A8 L. This suspension variant offers a unique comfort experience in the luxury liner that is up to 5.30 meters (17.4 ft) long. This fully active, electromechanical suspension system drives each wheel individually and adapts to the road as needed using the front camera built into the windshield. Each wheel has an electric motor which is powered by the 48-volt main electrical system. The various suspension components from the rear-axle steering through to the suspension control systems are processed centrally by a control unit – the electronic chassis platform (ECP). As such, the full-size class offers greater comfort and sportiness in equal measure. More than three dozen driver assist systems and an extensive sensor set make Audi’s full-size models the ideal travel companion. The central driver assistance controller (zFAS) uses up to 15 sensors to compute a permanent image of the surroundings. These include four front corner radars, a long-range radar and a front camera as well as various ultrasonic sensors. The top innovation is the laser scanner, which further augments the functionality of various assist systems. The sensors are configured redundantly for maximum system reliability. The Audi A8 is the first automobile to have been specially developed for piloted driving at SAE level 3. The traffic jam pilot takes complete charge of driving in slow-moving traffic at up to 60 km/h (37.3 mph) on freeways and highways where a physical barrier separates the two carriageways. In planning the exact introduction scenarios for the level 3 system, Audi is moving in an intensive interplay between the findings from testing and the requirements that legislators and approval authorities are now defining for conditional automated driving. 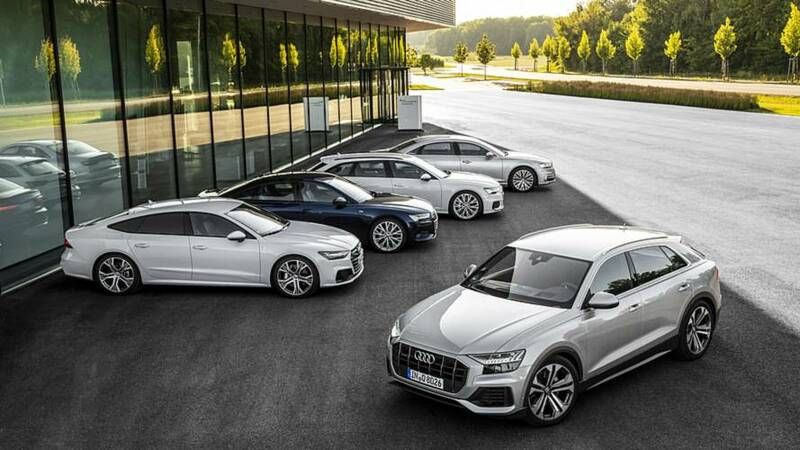 Audi offers the right solution whatever your needs, from the A8 luxury sedan, the A7 Gran Turismo, the A6 company car, the A6 Avant touring car and the Q8 – the beau among the SUV coupés. As the newest member of the Q model family, the Audi Q8 with its expressive exterior appeals to design-oriented customers and, thanks to the long, flat roof line with its gentle downward slope, makes no compromises in terms of spaciousness and everyday practicality. Luxuriously equipped with numerous comfort and connectivity features from the A8, the SUV coupé also cuts a fine figure off-road and is a poised companion for business and leisure. The upgrade in the business class. 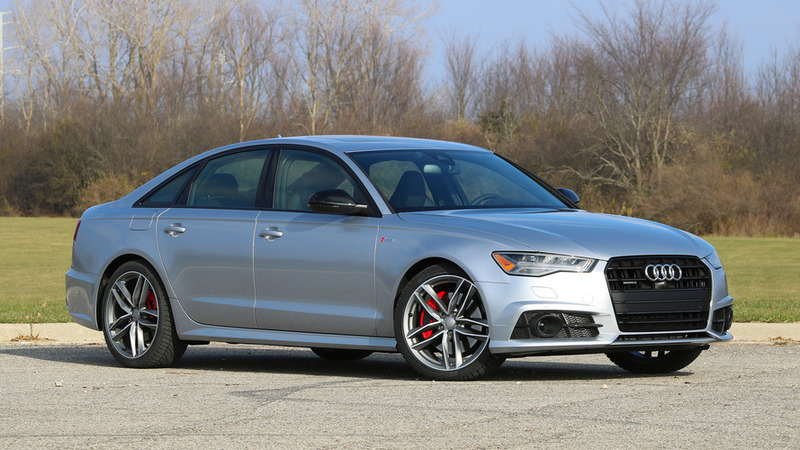 With the A6, Audi is presenting the eighth generation of its successful full-size sedan and brings numerous innovations from the luxury class to the full-size class. Whether in terms of digitalization, comfort or sportiness – the elegantly sculptured Audi A6 is the multitalent in the segment. Like almost no other model, it symbolizes the Audi brand worldwide, for company car drivers in Europe, performance-oriented customers in the United States or as a technology status symbol in China. Attractive station wagons go by the name Avant – the new Audi A6 Avant continues this brand aspiration. It combines superb everyday utility and excellent adaptability with dynamic design. The rear has a striking design, yet offers a flexible luggage compartment concept with 565 to 1,680 liters (20.0 – 59.3 cu ft) of luggage capacity. The drive and suspension are designed with comfort and sportiness in mind. The dynamic all-wheel steering really does live up to the name of Avant. The large four-door coupé is the essence of Audi’s new design language. Emotive design, plus the sporty character and innovative technology: The new Audi A7 Sportback is a new style of Gran Turismo, offering systematic digitalization, a dynamic driving experience and a space concept that fulfills a wide range of customer requirements. It is enthralling with the design of a coupé, the comfort of a sedan and the variability of an Avant. The fourth model generation of the Audi A8 is again the reference for Vorsprung durch Technik. The luxury sedan demonstrates this with a new design language, which embodies elegance and progressive status, innovative suspension solutions, futuristic touch operating concept and consistent drivetrain electrification. The new Audi A8 is the first series-production automobile in the world to have been developed for conditional automated driving at level 3. The new black gloss package extends the customization options for the large sedan and adds sporty highlights – including on the Singleframe, bumpers and window strips as well as optionally on the exterior mirrors.